Yesterday proved to be one of my best birthdays in years. Over $300 was spent among ten individuals (two paid $20, all five of my daughters spent $130, and I spent nearly $150 not only for my birthday, but also preparing for the winter storm) and proved to be a BLOWOUT. The last time I had a best birthday, George HW Bush was President, Fort Wayne anchorwoman Melissa Long (if memory serves me) went from WISE-TV (then WKJG, channel 33/former Marion cable channel 18) to WPTA-TV (channel 21/former Marion cable channel 21), Tom Cochrun and Anne Ryder were the main anchors at WTHR “13NBC” (Marion Cable Channel 13), and Mandy Davidson became my first girlfriend. That was on my 10th Birthday in 1993. Also the last time a lot of money was spent on my birthday, I was in Kindergarten. I had my aunties Shirley, Colleen, Marylin, and Carolyn, several cousins, Patricia, Linda, Sharon, Rob, as well as Carol, Rick, and Vicki–the former of the four as of January 2014, are currently the only remaining family left for yours truly. That was my sixth birthday back in 1989, and only had two friends — Jacqueline Florea and the late Robyn Matthewson (then Robyn Mort from 1989-1992 and Robyn Hurd from 1992-2011). 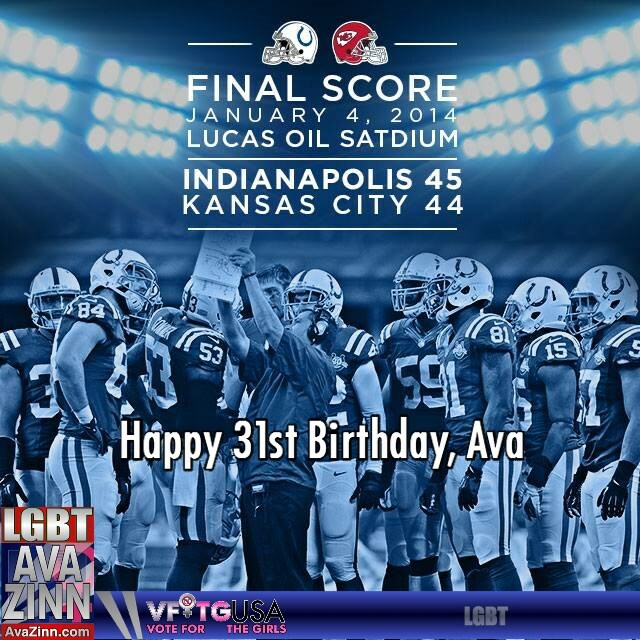 This time around, with a perfect 2013 thanks to Vote for the Girls victories of Candice Glover, Danielle Bradbery, Tessanne Chin, and Alex & Sierra, and the Colts defeating the Kansas City Chiefs, proved to be the best birthday since 1993. As with any birthday of mine, there are new rules that go into effect. One rule that was supposed to go into effect was the Pay to Visit Ava in which visitors pay the fare for appointments that last more than 90 minutes (the person pays $1.75 for that appointment). For an overnight pass, that becomes $4.00. A Weekly pass (subject to lease approval) would cost the person $20 and the monthly pass (also subject to lease approval) becomes $60. However, that is currently under review. Another rule now in effect is the four-room challenge (living room, kitchen, bedroom, and bathroom) and they are now at 100 point scale (this is for the folks at CSP in Marion and will be in effect at CSP in Indianapolis effective on the day of my arrival as a resident). The first such four-room challenge was on January 2, 2014 with a score of 97.5 average with the 20 point bonus for the Vote for the Girls victories of Tessanne Chin and Alex & Sierra on The Voice of America 5 and The X Factor USA 3, respectively.